It’s Sunday night and I’m thinking back over my week of running. I usually run 3-4 times a week including a Monday & Tuesday but due to relatives visiting and a friend’s birthday my first run of the week didn’t happen until Thursday. I was more than ready for that run and ended up clocking 10km. You know some nights you just need a run or you might explode? It was one of those. Next up was Parkrun on Saturday morning. Last week I hit my PB bang on (24:56) so this week I thought I’d push myself and try to beat it. I made sure I wasn’t too far back to begin with & kept a good pace to finish at 24:37 – a new PB! I was running into the wind for the last km which was tough but I kept the 25 minute pacer in my sight and ended with the obligatory sprint finish! This morning, I ran 1 mile (wait for it, there’s more) to Junior Parkrun where I gave out the finish tokens as well as cheering and giving high fives to enthusiastic little kids (and their parents). Once that was over, I set off again and ran an additional 10 miles out and back along the quay. It was cold yet beautifully sunny so once I got going I was pretty warm but able to keep a steady pace. On the return leg of the run I was once again battling with the wind, which meant I had to work hard for the last 4 miles. I rewarded myself with a coffee at the quay afterwards before heading home to eat everything in sight! I’m pleased with myself for getting out and doing a long run despite not having any races to train for in the next couple of months. I don’t think I have ever kept up the long distance in the weeks after a race but I am determined to maintain it over winter so that I’m not struggling in the new year! I have signed up to Run Up To Christmas to keep me motivated in December so hopefully that will also help balance out all of the chocolate & prosecco I will be consuming! Anyone else trying to keep motivated now that it’s turning colder & darker? What, there are other people just as keen as you?! 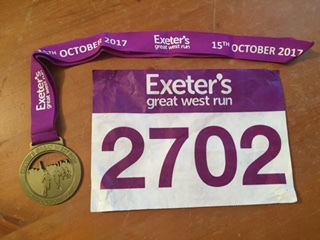 I moved to Exeter in 2016 and prior to moving I had already looked up running groups and found out that there was a half marathon in October, so of course I wanted to train for that. I had been part of a club at home and I knew it would be a good way to meet new people in a new city, give me something to do in the evenings and keep up my fitness. 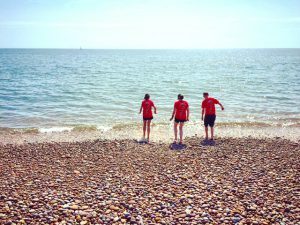 You might expect a blog post like this to be about someone who thought running clubs were scary & they needed a friend to drag them along only to find out it was amazing and it changed their life. I already knew it was going to be a good decision to along to a club night because runners are very supportive & friendly! I also like meeting new people but I don’t like running in the rain so if there are people out there that can convince me to do that then it can only be a good decision! I don’t remember when this happened exactly but I started following @UKRunChat on twitter. One day I realised they were advertising a run around the Rhino statues in Exeter. I thought this would be amazing! There would be hundreds of people out for a run, what a great thing to be a part of! I told my friend Pip about this and we decided to go along. After waiting a while at the wrong Rhino statue (typical!) we found our fellow runners – all 6 of them! Turns out this was not the huge event I imagined! 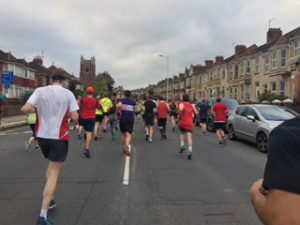 This was a run organised by UK Run Chat Exeter, a relatively newly formed running group. It’s now over a year old and there are 26 in the Whatsapp group. We like to do sessions that you wouldn’t normally do by yourself like banana hill sprints or relay races on the quay. We meet for Parkrun on a Saturday morning followed by coffee & cake and a lot of us help out at Junior Parkrun on a Sunday. Just like UK Run Chat as a whole, it feels like a community rather than a club you go to once a week. Outside of work, joining UKRC Exeter is probably the best thing I have done since moving here. 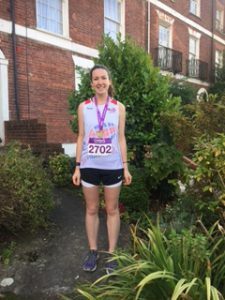 I have met wonderful people who I think of as family more than friends, pushed myself to achieve new personal bests in races and have co-hosted the UK Run Chat hour on twitter – the account that brought me to the club in the first place. I feel very fortunate to be part of such a supportive, hilarious and welcoming running group. Leave a Comment on What, there are other people just as keen as you?! It’s currently a pre-race day for me but my thoughts in the lead up to the Great West Run have been slightly overshadowed by my recent Edinburgh marathon registration. 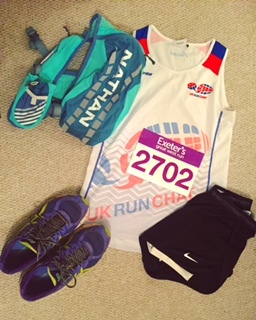 So before I put a pasta bake in the oven and lay out my kit for that all important Instagram, I thought I would share my reasons for choosing to a run a marathon. I should say that I might change my mind about these in the future as I haven’t even ran a marathon yet so how should I know how good it will feel or what would make other people also run one? I guess these reasons can be applied to any race distance and for running in general. Have a read & let me know what you think! To achieve a goal. I have already ran a few half marathons and I have got to the stage where I can run past the 13.1 mark in a training run so I think it’s time to up my game! I love that feeling when you have ran further than ever before and suddenly feel invincible. Then you push hard for the last mile, pain hits and you start to question everything again! Seriously though, that sense of achievement is a fantastic feeling and you’ll not only get that when crossing the finish line of a race but with each long run that you do. To get fit/be healthier. I think running is one of the best ways to stay in shape and running a marathon is going to make you think more about your body and what it is capable of. 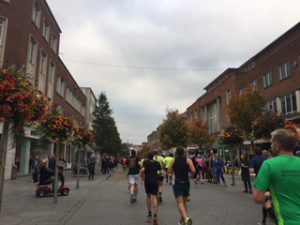 I feel quite fit as it is due to recent half marathon training but I know full marathon training will make me think more about what I’m eating and the different types of running sessions that I am doing. Travelling / visiting a place you love. I’m happy that the race I am doing tomorrow is within walking distance from my flat but sometimes the adventure of travelling to a race makes the whole experience even more exciting. I have chosen to run the Edinburgh marathon because I went to uni in Scotland and have a lot of family & friends living there so it is a place very close to my heart. 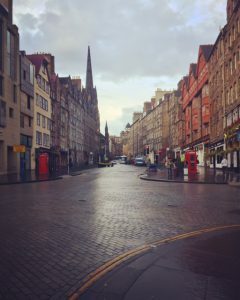 I have ran the Edinburgh half 3 times and loved every second of it (apart from in 2015: post-dissertation meant very little training and a lot of toilet stops – maybe more on that in another post?) so I know going back for the full thing will be fantastic. I also didn’t get into London but hey, what can you do? To raise money for charity. I absolutely love running a race and reading the names of charities and the special messages people have written on their t-shirts. I raised money for Helping Hands – the charity to the Royal Belfast Hospital for Sick Children in 2014 and the support I received was wonderful. Recently, at the Great North Run, a friend ran for Sue Ryder and we arranged to meet in their tent afterwards. They gave me such a warm welcome despite having not ran for them myself and I thought how great it must be to be in the community of people running for the same charity. You can motivate each other and celebrate together. Making new friends / joining a group. I am lucky to be part of 2 great running groups in Exeter and the combination of long runs, sprints and hill sessions make it easier to get training in during the week – especially in winter when it’s raining and all you want is a glass of wine in front of the TV. I am hoping that marathon training will make me more committed to the club sessions and really value what we are doing. Of course, as time goes on and I chat to more people who have actually ran marathons I hope to make more friends who I can ask questions to and find out what it’s really like. Now it’s pasta bake time!